I was a vet tech, lab tech and pharmacy tech so I am a do it yourselfer based on my education and practical experience. Since I dont have easy access to Kirk & Muller ( a very widely used diagnosis and treatment manual) and other important basic vet clinic books, I do sometimes need info..especially dosing info. The last item I ordered was a ratan headboard and the delivery thereof was a REAL pain in the backside..lousy communication because they used a contractor trucker and shipper. What a mess. The box was damaged and the headboard had a touch of damage but not where it could be seen. I am now considering buying a small appliance which should come by regular mail..the consideration is because it is on sale and amazon and ebay do not have it for the price which is shipped free but state tax a Plus if its defective I can just zip over to my local store for a return if I cant get a freebie return ship label. Also use the online order and ship as well. Never disappointed. Free shipping good prices and orders always get here on time or before. I live on Amazon to comparison shop and have an amazon "prime" membership to avoid most shipping charges and also I get Amazon tv/video/movie subscription thru it as well. Amazon prices are pretty competitive and I LOVE ALL the merchandise choices. Amazon is #1 with me and Ebay is #2. But amazon returns is a lot better and I have a huge fulfillment center near me and my orders get here asap. I have done both types of shopping and I detest our local brick and mortar stores as they are staffed with dipsticks. I have purchased several items online. Got free shipping and good prices with some of the things..was hoping not to pay tax since the shipping unit was located in another state....but alas the get you by those financial short hairs too. The caveats I have is that these clothes are very cheaply made for the most part and dont fit all that well. Plus the shipping is ridiculous and I paid tax. I have never used QVC to a huge degree because they make me pay tax and NO OTHER online shopping site does wit the exception of the one located in my state. Also the shipping is higher than other sites. QVC isnt what it used to be and I think its over priced..but they are located n the NE so perhaps for the people living there, the prices are good. I only order if its something I really like and cant get anywhere else. Back when I had some bucks I used to order a lot of shoes from this site. I only ordered once because they had something that I wanted that no one else had. The prices are okay..no real breaks per se. They have a decent variety. I feed purina because I usually have coupons, bu I add a touch of olive oil or a pinch of dried unsweetened coconut flakes or a bit of cottage cheese for extra nutrition and flavor. I really like using online Petco because our brick and mortars are staffed with twits. Any and all online orders Ive ever made were shipped for free or inexpensively and the price was good. 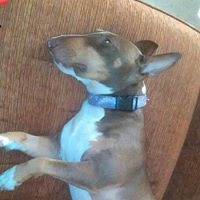 Wanted a bull.terrier rescue and found my baby on this site thru a girl registered on it who is a rescue person. The dog came fully vetted and I was able to go see her in her home etc etc. Margo hasn’t received any thanks yous. Margo doesn’t have any fans yet. Margo isn’t following anybody yet.